Anyone who thinks a candle is just a candle definitely hasn't ever come across one from Bond No. 9. The noted fragrance house has branched out into the candle-making business, and has packaged some of their greatest scents into absolutely stunning candles. This beauty chick's favorite? Obviously her favorite Bond No. 9 perfume, West Side! But while the notes of rose, peony and ylang ylang are what drew me in initially, it's the gorgeous packaging that really got me. 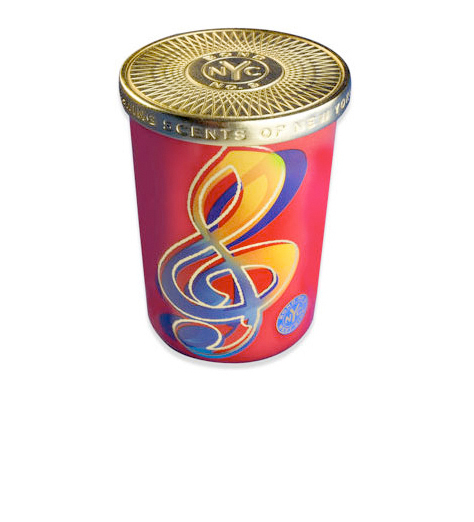 The oversized, boldly hued treble clef rimmed in gold calls me back to my days as a musician (yes, I used to play piano and sing! ), while the red pillar-shaped glass and intricately carved golden top are just so sultry and seductive. Even better, the candle has a 60-hour burn time, which means I can enjoy it for days and weeks to come. And my favorite part? The candle is accompanied by a miniature wrapped bon-bon of the West Side Eau de Parfum! The Bond No. 9 West Side Scented Candle retails for $95 at bondno9.com.